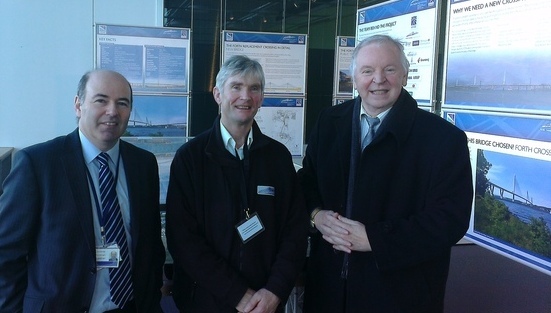 “Excellent progress” is being made on the Forth Replacement Crossing, according to Dunfermline MSP Bill Walker on a recent visit to the newly built Contact and Education Centre adjacent to the Forth Road Bridge. Mr Walker said: “All the signs are that the Forth Replacement Crossing construction is fully on target for completion in 2016. Some parts of the work are already complete ahead of schedule, such at the new roundabout now opened on the M9 motorway and, here in Fife, the ITM traffic flow system and improved bus lane heading south on the M90. “From the Fife coast, you can easily see the construction work progressing on the mid-Forth Beamer Rock, on which the central tower of the new bridge will sit. Even the Contact and Education Centre, which will later be converted into a Visitor Centre, was finished ahead of schedule.